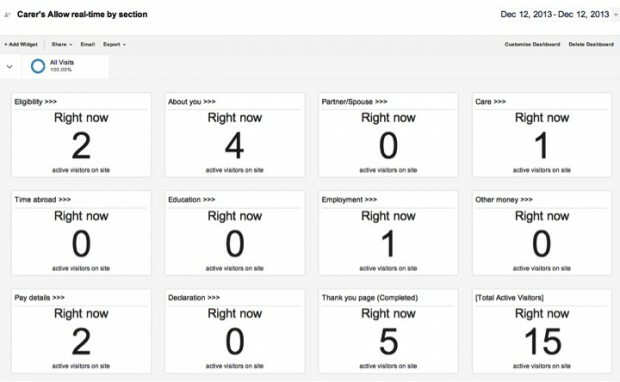 Product analysts on GOV.UK can access a vast amount of user behaviour data through web analytics. We’re always looking for different ways to mine this information to discover new and interesting insights. One area we’ve tried recently is examining real-time data. I want to share some of the work we’ve been doing with real-time data, and mention a technique we’ve found that might help other teams to make it even more useful for them - without them needing to write any code. Real-time data appeals to people’s sense of curiosity. One of the first products we made using real-time data was a basic screen of rolling search terms. We regularly analyse how people are searching the site, but making this constant stream of requests visible on a big screen made colleagues much more aware of search and user needs. People are mesmerised by the endless list of queries - the ability to see what people are searching for right now, the sheer range of topics, and how words are misspelled. It’s useful when there’s a big breaking news story or topical event, as we can see related search terms cropping up more often among all the usual day-to-day dealings with government. The immediacy of the data often inspires action. Spotting an unusual search term as we walk past forces us to pause and think ‘what on earth is that?’ or ‘how we can make our site navigation work better for users to reach that topic?’. On GOV.UK we have a Departments and policy section that subdivides into several areas such as news, consultations and policies. An aggregate view of the number of current visitors on this section of the site isn’t that useful to us - it’s too high level. What we wanted was to be able to show current visitors to each of the sub-sections and display this on one dashboard. It was then just a case of rearranging the widgets into a dashboard. This technique should be possible with any vendor which provides real-time data and dashboard widgets. 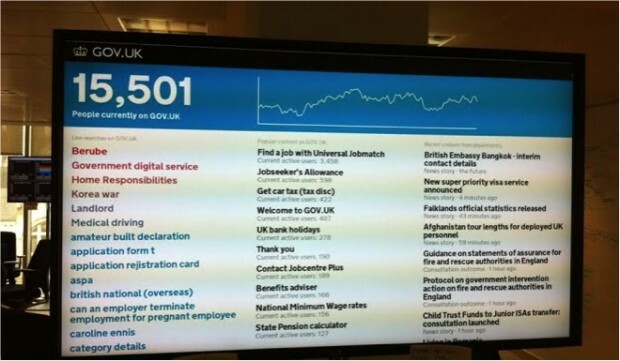 The dashboard is now displayed on a big TV screen next to our Departments and policy team, allowing them to instantly see the relative popularity of sections and if sections are receiving unusual levels of traffic. This technique works particularly well when applied to a transaction site as the active visitors can be broken down to show how far they have got through the service. 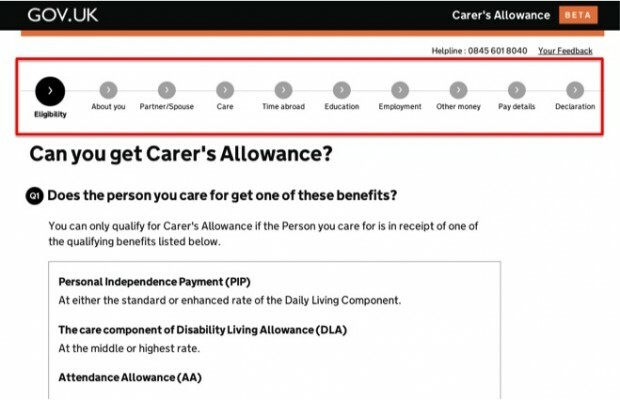 The Carer’s Allowance site allows carers to apply for financial help from government using an improved online service. It’s one of 25 exemplar services GDS is working with to make them simpler, clearer and faster to use. This extra instrumentation is helping the team better understand the user journeys and where people are tending to drop-off so they can continue to improve the service. We’ll be doing more work with real-time data across GOV.UK products and services and will continue to blog about what we learn. In the meantime, if you have any interesting stories about using real-time data please do share them in the comments. great and very useful article, thank you! Now I am trying to find any tool, which is able to send me an sms/email alert when real time traffic on my website increases. Actually I am using google analytics alerts, but there is a long delay, I need some "real time" tool. Thank you. It covers how we've used the Google Analytics 'Magic Script' to to pull usage data in the past hour and to send an email alert when particular thresholds have been reached. You can replicate the dashboard by simply creating widgets set to the example shown above. Use 'Active Visitors' as your metric and filter for the specific page or pages you want to feature in the widget. 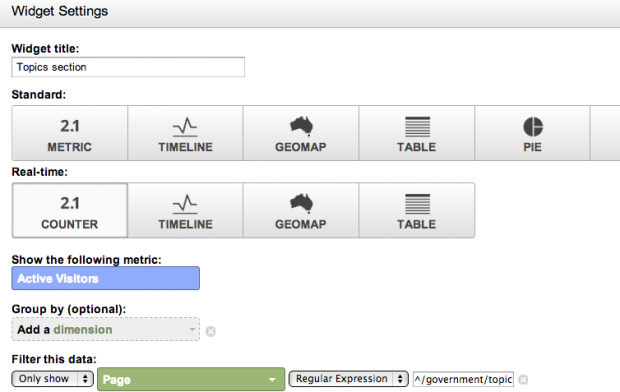 There are a maximum of 12 widgets you can create in a Google Analytics dashboard. I've done something similar in my university IT department. However I also rotate the dashboard to a live stream of an 'off-topic' web cam to help build and *maintain* interest in, and contact with, the data. There is a danger that plasma TVs broadcasting 'live IT data' can become ignored soon after their initial creation. Perhaps this is banner blindness, or an assumption that the data, whilst live, never appears to change (...unless you spend time and go deeper). I'd be interested in hearing about other peoples implementations and any effect it may have had on production systems, or upon organisational culture. I like this review of real time data. What tools are there out there that an average business could use to get the same results or this all built in house?Are there more examples of how this data has driven a change for the better for the end customer? Thanks for your comment. Most of the popular analytics vendors, including Google Analytics and WebTrends have 'real-time' data features. The real-time internal search terms screen was created by a developer using an API. 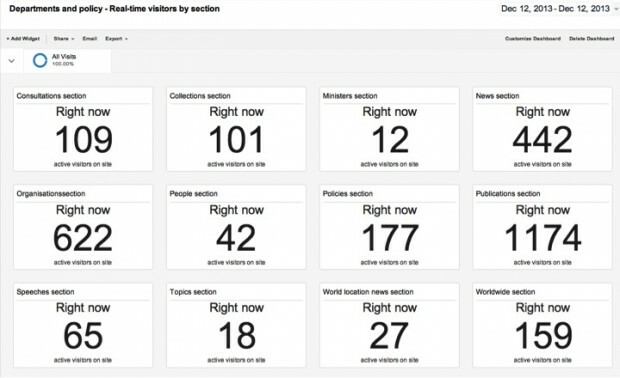 For the dashboards we just manipulated the real-time features that were available to us in our analytics UI. We're still experimenting with real-time data and using it more on services we are building. It's helping us see the volumes of traffic coming in at different times of the day and to identify the stages where users are potentially struggling so we can do more testing. Thanks for the information in the post - I've copied the idea of the topics dashboard for our (local authority) website, which works really well. Is the code for the real-time internal search terms screen available on the GDS github at all? The code is publicly available here: https://github.com/edds/display-screen, we'll be interested in seeing how you apply it for your own organisation.